This Thai grilled shrimp is extremely flavorful and is sure to please anyone who loves Thai flavors. It is the marinade that makes the shrimp sing—a delicious Tom Yum paste which can be whipped up in your mini-chopper or food processor in no time. This paste can also be used to make a delicious side sauce (which is nice with rice), although the shrimp are just as wonderful eaten right off the grill. If desired, you can add some scallops to your grilled shrimp brochettes. This marinade is also terrific on grilled fish. Place shrimp and scallops (if using) in a bowl and pour 1/2 to 3/4 of the marinade over (depending on how much shrimp you are making). 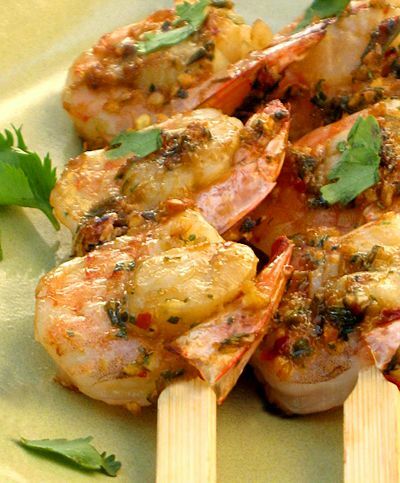 Slather the marinade over the shrimp with your hands or stir gently with a spoon, ensuring all the seafood is coated. Reserve remaining marinade for the side sauce, if desired, or refrigerate to use later. Marinate the shrimp 10 to 12 minutes (no longer, or the lime juice will cause some of the seafood's natural juices to leak out). If using wooden satay sticks, soak them in water for 10 minutes to prevent burning. Heat the grill to medium. Slide the shrimp onto the skewers. If also making scallops, weave the scallops into the inside of the shrimp's curl. Grill the brochettes 8 to 15 minutes, turning once, or until shrimp are pink and plump and have firmed up. Baste the shrimp the first time you turn them with a little of the leftover marinade. If making the side sauce: Place reserved marinade in a small saucepan over medium-high heat. Simmer the paste for 30 seconds to 1 minute, then add the coconut milk or cream, stirring to create a sauce. Taste-test the sauce, adding more sugar if too sour. If too spicy for your taste, add more coconut milk or cream. If too salty, add more lime juice. Add more chili for a spicier sauce. Serve the shrimp hot off the grill, either on their own or with rice and the side sauce. Top with a little fresh coriander, if desired.